The conference will take up the issue of Value-based Healthcare at the morning. There will be a keynote lecture as well as panel discussion with insightful panelists. The conference will be facilitated with participants of regulatory authorities, academia and pharmaceutical industries in Asia. We believe you would satisfy the session and feel it was very much informative. 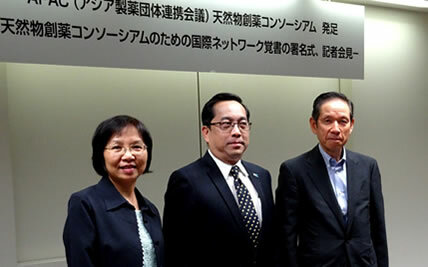 The signing ceremony for APAC Natural Products Drug Discovery Consortium was held by the ASAP* representatives of Japan (JPMA), Thailand (TCELS), and Taiwan (BPIPO) at the JPMA on Oct.12. With all of attendees’ support, the 7th APAC conference was successfully held on April 10th, 2018 at Keidanren-Kaikan in Tokyo with more than 350 participants including regulators, academia and industries. We are pleased to announce you that we have uploaded all the presentation materials on this homepage by today. We invite you to visit the ACHIEVEMENTS. Please also visit ABOUT US – Welcome message. You will find a message from Mr. George Nakayama, the new president of JPMA elected on May 24th, 2018. We hope that your stay in Tokyo will be informative, fruitful and, last but not least, enjoyable. Save the date to join us at the 7th APAC Meeting in Tokyo, April 10, 2018. The Meeting will be held at Keidanren Kaikan located in 1-3-2, Otemachi, Chiyoda-ku, Tokyo. APAC is delighted to welcome China Pharmaceutical Innovation & Research Development Association (PhIRDA) as a new member. Click Here For More Info about PhIRDA! The information of APAC 6th concept paper, Pillar4 and Pillar 5 has been uploaded. As a reminder, we have uploaded all the presentation materials. We invite you to visit the ACHIEVEMENTS. Thank you very much for everyone who participated in the 6th APAC in Tokyo. The weather, cherry blossoms and session presentations/discussions made the conference successful. Over 320 attendees were exposed to informative and worthwhile topics related to Access To Innovative Medicines, Drug Discovery Alliances, Regulations & Approvals and Keynote Lecture by outstanding speakers. We will continue our efforts to accomplish our mission. 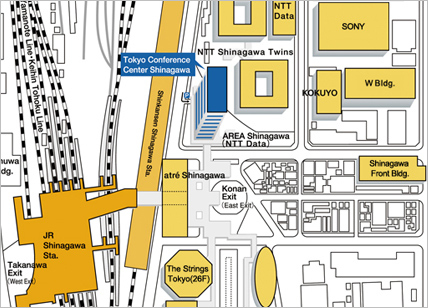 We are pleased to announce that the 6th APAC meeting will be held in Tokyo Conference Center Shinagawa on April 5, 2017. 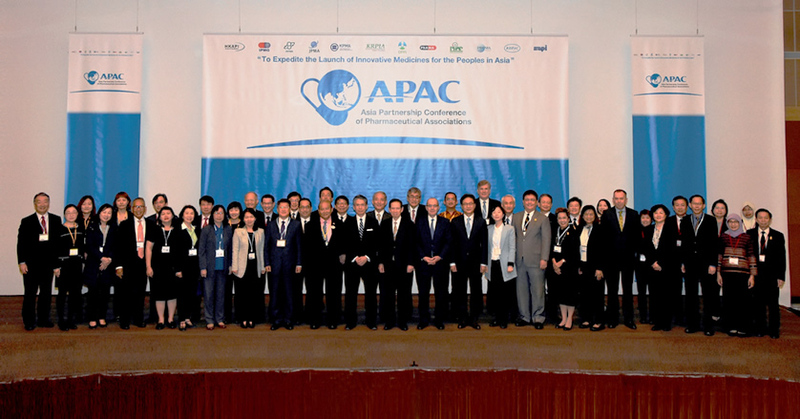 APAC is an industry-government cooperative initiative led by R&D-based pharmaceutical associations in Asia, aiming to fulfill its mission, i.e., “To expedite the launch of innovative medicines for the peoples in Asia”. In consideration of the recent movements of Asian governments’ healthcare enhancement, especially in GMP/Quality area, we will have a session on GMP in the “Access To Innovative Medicines (ATIM)” session. 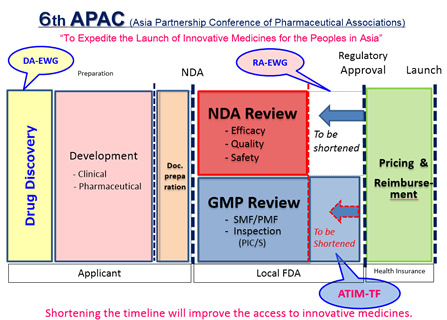 In addition to the ATIM session, we will have “Drug Discovery Alliances (DA)” session to be discussed about drug discovery cross-border open innovation using natural resources and “Regulations & Approvals (RA)” of which theme is how to extend GRM (Good Registration Management) guideline in Asia. Please see the attached program. When is the 6th APAC Meeting? When does the last sessions end? What is going to be held on Day 2? 2017-01-26 The 9th Asia regulatory Conference (ARC): Register Now! The 9th ARC will be held in Tokyo, 6-7 April, 2017. The online registration system is now open. Save the date to join us in Tokyo! 2017-01-15 APAC RA-EWG collaborated with APEC LSIF RHSC for the Regulatory Science Center of Excellence Pilot Workshop on Good Registration Management (GRM) held in Taipei on November 15-17. APEC Good Registration Management Regulatory Science CoE (Center of Excellence) pilot workshop was held in Taipei on November 15-17, 2016. APAC RA-EWG participated in this kick-off workshop as one of the co-organizers and supported the Applicant-specific session on the Good Submission Practices. The outline and presentation materials of The 5th APAC meeting have been uploaded in the achievements. 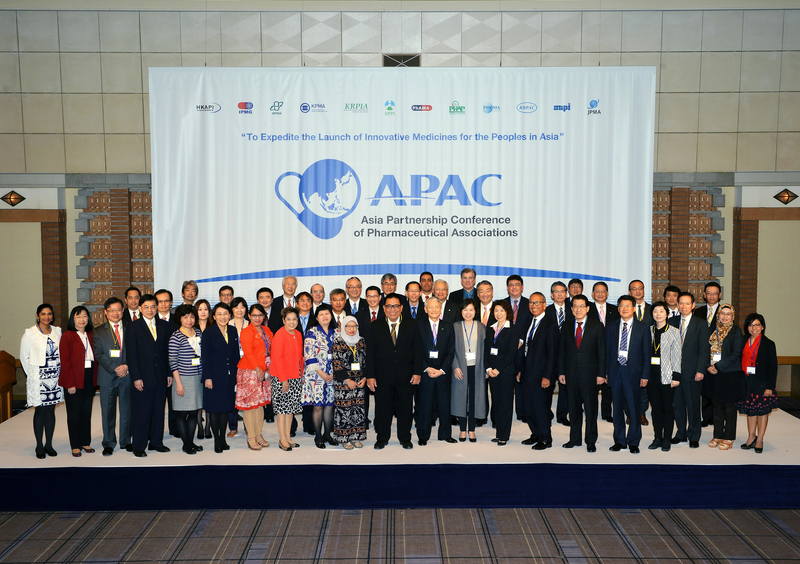 The Fifth APAC　(Asia Partnership Conference of Pharmaceutical Associations) was held on 7th and 8th April with the mission of “To Expedite the Launch of Innovative Medicines for the Peoples in Asia” under the theme of “APAC’s continues challenge to create and improve access to innovative medicines”. On behalf of APAC (Asia Partnership Conference of Pharmaceutical Association), we are pleased to inform you that the Fifth APAC meeting will be held in Tokyo on April 7-8, 2016 under the semi-closed basis. APAC is an industry-driven initiative led by R&D-based pharmaceutical associations from Asian countries, aiming to fulfill the mission of “to expedite the launch of innovative medicines for the peoples in Asia”. And, the theme of the 5th meeting is “APAC’s further challenges for the creation of innovative medicines and improving access to innovative medicines”. In consideration of the recent movements of Asian governments’ healthcare reforms, we will have an Access To Innovative Medicines (ATIM) session at the next meeting inviting as many high ranking officers, and to discuss “what APAC can contribute toward establishing public private partnerships that will enable patients to access the innovative medicines much faster”, in addition to two expert working group session of “Regulations & Approvals” and “Drug Discovery Alliances”. Just for your reference, please see the attached program draft. We will feedback the outcome of the event on this web-site soon after completion of the meeting.